Valuation is at the heart of any investment decision, whether that decision is buy, sell, or hold. But the pricing of many assets has become a more complex task in modern markets, especially after the recent financial crisis. 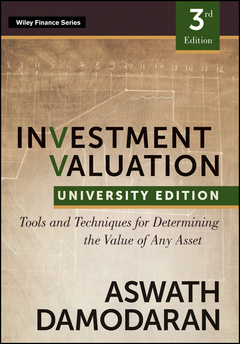 Now completely revised and updated to reflect changing market conditions, the Third University Edition of Investment Valuation provides expert instruction on how to value virtually any type of asset*stocks, bonds, options, futures, real assets, and much more. A perfect guide for those who need to know more about the tricky business of valuation, the Third University Edition of Investment Valuation*which includes an instructor's companion site*will be an essential asset to anyone learning about this critical part of the investment process.